Recap of 10/15/14 meeting on Poetry and Odes. On October 15 the One Page Poetry Circle met to discuss Poetry and the Ode. Abigail began the evening with a poem by Mark Twain, who is known more for his fiction than his poetry. The work of a thirteen-year-old character in the novel Huckleberry Finn, “Ode to Stephen Dowling Bots, Dec’d” records a death: “O no. Then list with tearful eye,/Whilst I his fate do tell./His soul did from this cold world fly,/By falling down a well.” Twain’s parody of obituary poetry is also a parody of the ode. The poet expresses no personal emotions, she simply delights in writing about strange deaths. Roger read John Keats’ famous “Ode on a Grecian Urn,” a poem that has raised a lot of controversy over its final lines, “‘Beauty is truth, truth beauty,—that is all/Ye know on earth, and all ye need to know.’” While the poem was familiar to all of us, we admired its phrases without reaching a consensus on its meaning. As we continued around the room and other poems were read we found many that referenced Keats’ poem in one way or another. Gail read C. Dale Young’s, “Ode to a Yellow Onion” which begins, “And what if I had simply passed you by,/your false skins gathering light in a basket,/those skins of unpolished copper,/would you have lived more greatly?” By the end of the poem Young has infused the common onion with myth and greatness. Karen read “Ode to Apples” by Pablo Neruda, which concludes, “I want to see/The whole/population/of the World/united, reunited,/in the simplest act of the land:/biting an apple.” We loved how Neruda combines the fall from Paradise through eating an apple and the possibility of reuniting the world through the same act. Neruda was definitely the poet of the evening. AnnaLee read his “Ode to my Socks,” which concludes with the moral, “beauty is twice beauty/and what is good is doubly good/when it is a matter of wool in winter.” The ordinary becomes the beautiful and the sublime with a final nod to Keats’ Grecian Urn. AnnaLee gave us a link to Sharon Olds’ “Ode to a Composting Toilet,” a poem that takes Neruda’s odes on ordinary objects to an extreme. Merrie closed the Circle with “Curiosity” by Alastair Reid, an ode to his own life, “Only the curious/have, if they live, a tale/worth telling at all.” Certainly all the poets we discussed had a tale worth the telling and we enjoyed hearing the tales together. Mady couldn’t join us but emailed to say that if she had attended she would have brought Pablo Neruda’s “Ode to the Table” which begins with the process of creation:: “I work out my odes/on a four-legged table/laying before me bread and wine/and roast meat” and ends with “The world/is a table,” and “let’s eat!” Using the everyday Neruda sets his ode in motion to show us we can come together at the common table, if we choose to partake. Mark November 4th in your diary and remember to join us then. We look forward to reading and discussing your selections for our next program, Poetry and Politics. Try our blog. Click the little speech balloon next to the title of this notice and post your thoughts about the poems we discussed on October 15. On September 9 we met to discuss Poetry and Cats and Dogs. We had a nice turnout after our hiatus over the summer. Abigail began with “The Duel” by Eugene Field. She remembered this poem from her childhood and enjoyed that the cat and the dog were equals. Although the rumor is that burglars had stolen the gingham dog and the calico cat from the table, “the truth about the cat and pup/Is this: they ate each other up!” As one member remarked, it’s an anti-war message. Phil brought William Blake’s “The Tiger,” which he had memorized in grammar school, “Tiger, tiger, burning bright/In the forests of the night,/What immortal hand or eye/Could frame thy fearful symmetry?” This led to a delightful conversation on the advantages of students memorizing poetry, which we fear they no longer do. Terry read “A Cat, A Kid, and A Mom” by Shel Silverstein which questions why we want anyone to change: “‘Why can’t you see I’m a cat,’ said the cat,/‘And that’s all I ever will be?’” We laughed at this lovely evocation of how a cat, a kid and a mom can all misbehave. Gail read “A Dog’s Life” by Daniel Groves consisting of beautiful couplets and puns that tell of the day the dog was put down, “the very dog who, once would fight to keep/from putting down, despite our shouts, a shoe.” A discussion of how we have turned our dogs into slaves who are dependent on us followed. The expression “it’s a dog’s life” originally referred to how difficult a dog’s life was since the dog worked hard, ate scraps, and died young — unlike our dogs today. Mady brought Pablo Neruda’s “Ode to the Dog” in which a man and dog roaming the countryside until they are fused “in a single beast/that pads along on/six feet,/wagging/its dew-wet tail.” She could bring this poem next month as well! Hazel read “Little Puppy” from a Navajo American Indian relating the life of the Navajo woman and the little dog who shares her life of tending a flock and seeing, “The tall cliffs, the straight cliffs,/The fluted cliffs,/ Where the eagles live.” We all enjoyed this surprising and poem that in its simplicity painted such an evocative picture of the region. Merrie read a poem AnnaLee had brought, “Myself with Cats” by Henri Cole, which describes both a relationship between humans and one between cats, “withholding his affection, he made me stronger. ” We were delighted to have more attention paid to cats who seemed to get short shrift during the evening. AnnaLee closed the Circle with Cathryn Essinger’s “My Dog Practices Geometry” which examines the personification of animals by poets, “Nor do I like the mathematicians who tell me/I cannot say, ‘The zinnias are counting on their/fingers,’ or ‘The dog is practicing her geometry.’” We discussed our tendency to personify animals and whether it is wrong. 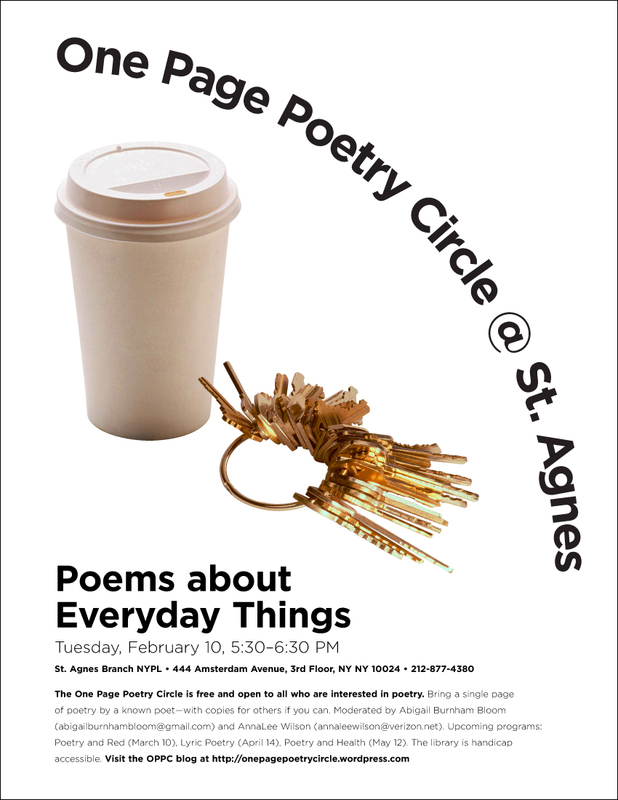 We look forward to reading and discussing your selects for our next program, Poetry and the Ode. Bring a friend and widen the circle! And remember to blog with us at onepagepoetrycircle.wordpress.com. Don’t be shy.